Cora SeQuence 8.5 introduces additional layers on HotOperations, support for SAML 2.0 and OAuth authentication, and the Go To Activity, a flow activity that enables you to run an unstructured workflow by jumping to another section of a workflow. HotOperations Operations Manager for sub-Root Groups: You can now define Operations Managers for the root group and sub-groups in a HotOperations solution, which enables operations managers to focus on the groups they are directly responsible for. For more information, see HotOperations Portal - Operations Manager. 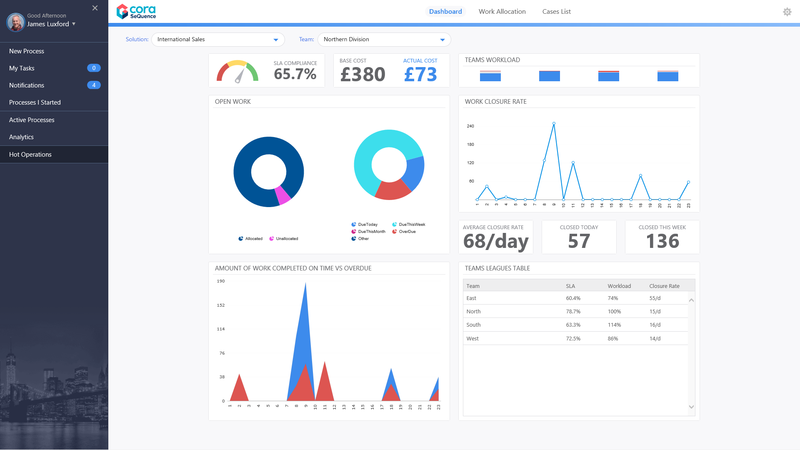 HotOperations Dashboard Suite: You can now create customized dashboards for HotOperations solutions, for both Operations Managers and Team Leaders. For more information, see Create a HotOperations Dashboard Suite. Workflow Design Time Roles: We created a specific set of permissions that define levels of access for users developing workflows in App Studio. 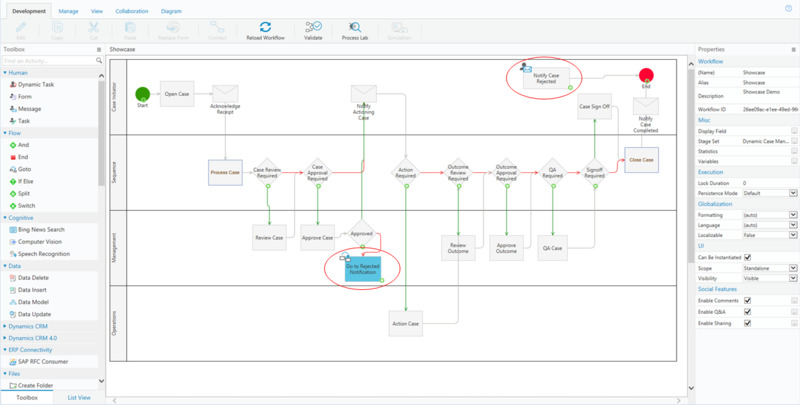 There are several out-of-the-box Workflow Design Time Roles. 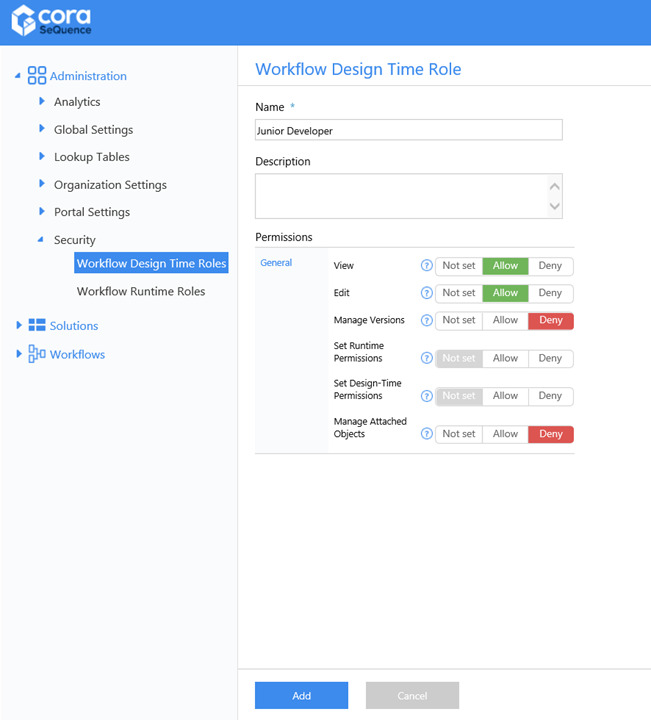 You can also create custom Workflow Design Time Roles. For more information, see Workflow Design Time Roles. Go To Activity: Enables you to run an unstructured workflow by jumping to another section of a workflow, based on input received from an activity that was executed earlier in the workflow. This reduces the number of physical connectors (links) needed in complex workflows. For more information, see the Go To Activity. Application Variables: You can now define dynamic variables that enable you to reuse values that you commonly use in Cora SeQuence. You define a key and its value in the Application Variables table, and then use the key in any Cora SeQuence expression. 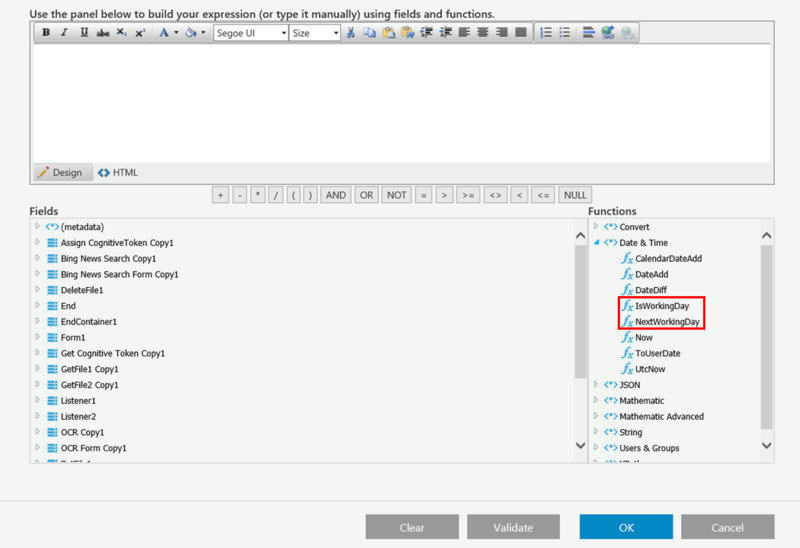 For more information, see Manage Application Variables. Dynamic Task Allocation Expressions: We created two new expressions that enable you to identify a dynamic task's assignments and allocations. AssignedTo: the users that a dynamic task is assigned to. AllocatedTo: the groups that a dynamic task is allocated to. Email Templates: When you upgrade from Cora SeQuence v8.4, you need to change the token markup for the templates imported during the upgrade. Replace the colon ":" with an equal sign "=", to render the expression in HTML format. HotOperations: The GroupId and SolutionId properties were added to the architecture of all HotOperations components. HotOperations Dashboards: We changed the HotOperations dashboard names and container names. 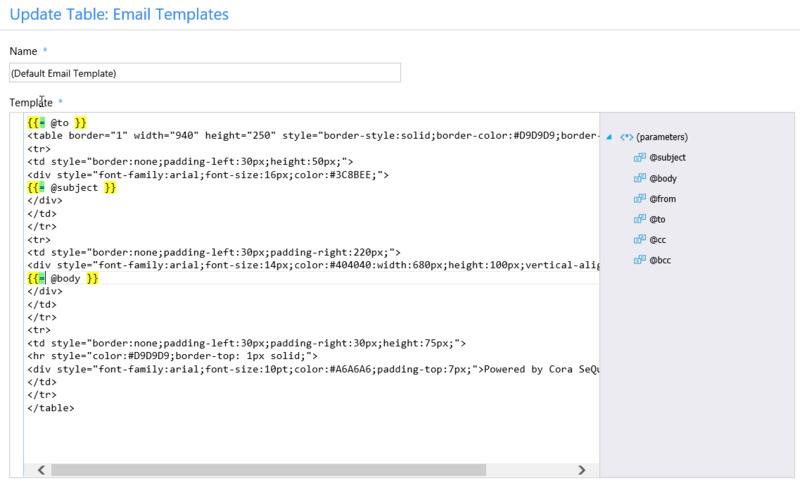 In SharePoint you need to configure the Data Stream name and Layout Name for Ops Manager and Team Leader. NOTE: If you have a SharePoint deployment, before implementing these changes contact the Cora SeQuence Support Team. Date & Time Expressions: We added two new calendar expressions that enable you to determine vacation days and non-working days, based on a specific user calendar. Import Workflows to Workflow Categories: You can now import workflows directly to workflow categories, enabling you to quickly manage workflows across environments. Azure AD Synchronization: You can now synchronize your Azure AD based on group membership using one or more organization id. Support SAML 2.0 Authentication: Cora SeQuence now supports SAML 2.0 Protocol authentication for all Cora SeQuence sites. 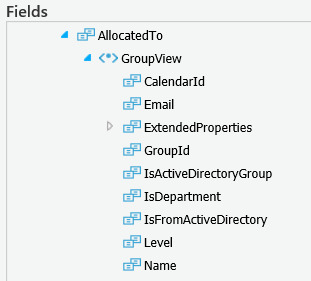 Migrate AD Manager Property: When you synchronize your AD with Cora SeQuence, you can pull the group manager property for users and assign them the manager role in Cora SeQuence. HTTP Consumer Management: You can manage all HTTP consumers from the Global Settings in the Administration site. Email Activity Enhancement: We added a default message body to the Email Activity. The email template screen does not utilize the entire screen. The error message you receive when validating a workflow data model is not clear. When a message contains a list of attachments from a grid, the message fails to be sent. When you perform a search in some Flowtime grids, pressing the Enter button does not execute the search. The error message you receive when you exceed the maximum number of users is not clear. 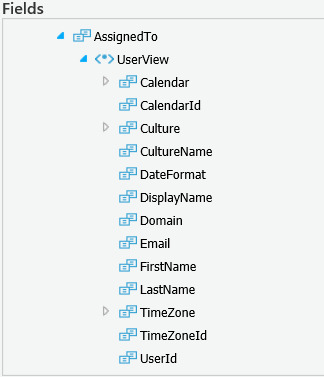 You cannot import a workflow that has a lookup table that references an external view in the database. The task due date is not calculated correctly when the task creation time is before the working day start time. JSON serialization issue in the ORG tree. After a task is submitted the My Task aggregation value is not refreshed. These instructions are for a new Cora SeQuence installation. If you are upgrading to Cora SeQuence 8.5 from a previous version, see the Upgrade instructions. If you are upgrading from a version earlier than v8.3.0, you must first upgrade to v8.3.0. For more information, see the Cora SeQuence 8.3 Release Notes. Download and unzip the Sequence 8.5.0 DB Scripts.zip file. Unzip the Sequence 8.5.0 Setup.zip file. Run the Sequence 8.5.0 Setup.exe file as an administrator. Navigate to Administration > Active Directory Settings to start the Active Directory wizard, and click Next until you complete the wizard. 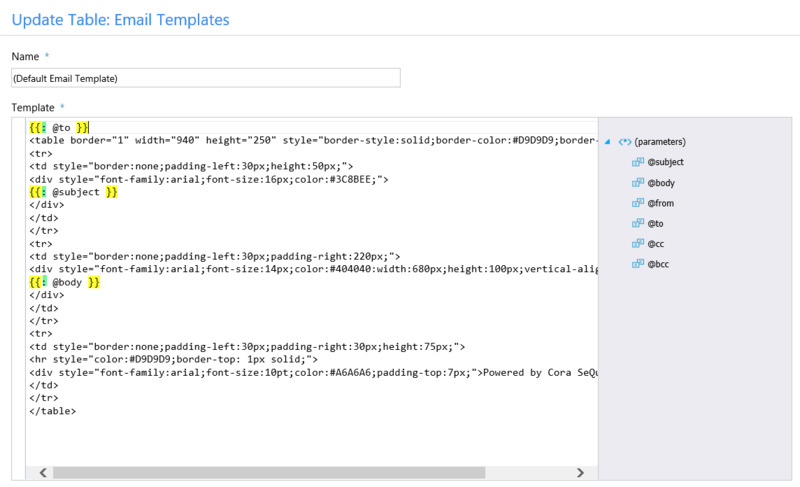 (Optional) Download and install Cora SeQuence Templates. For more information, see Cora SeQuence Workflow Templates. If you already installed the Cora SeQuence Templates in the previous version, they will automatically migrate during the upgrade.